Inspired by Jonas Gerard's dancing to paint? (If you haven't been introduced to Jonas Gerard yet, see my post from December 7, 2009, Dancing with the brush.) 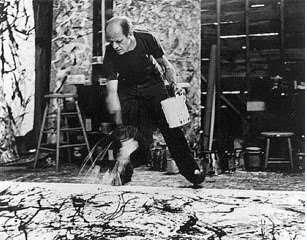 We are lucky to have film of Jackson Pollock painting, too – see examples at Jackson Pollock 51, which you can see on YouTube.com. Although he did not paint with the same sense of joy you can see in Jonas Gerard at work, he worked spontaneously, dancing with the brush (or stick) and paint. The scenes of Ed Harris as Pollock, painting in the film Pollock, are wonderful to watch, too. 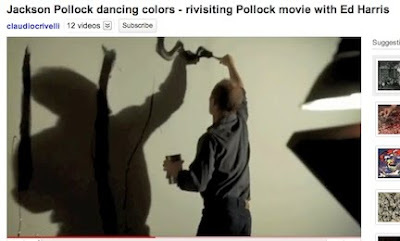 Here is a scene on Youtube.com – the clip is called Jackson Pollock dancing colors – he is painting his first monumentally large piece, after having torn out the walls of his studio in order to fit the canvas. Harris gives the viewer a good sense of the visceral, subconscious, dancing quality of the act of painting as Pollock practiced it.